How do you design a grass maze? Grass mazes are composed of informal arrangements of ornamental “clumping” grasses (i.e., that do do spread through rhizomes). Grass mazes support chase games like tag and hide-and-seek, and provide space for intimate conversations, rest, and reflection. Moving in the wind, soft grasses provide year round sensory stimulation. Grass mazes offer versatile layout options because of their flexible form. A minimum recommended overall size is 100 square feet (10’ x 10’ approx.). Of course they can be larger. Spacing between plants should be based on mature size, so children can easily move between them. Distance between mature grass heads can vary (6” to 30”) based on the desired character of the maze. A maze with closely spaced grasses feels and is used very differently than a maze with plants that are further apart. The on-center spacing of grasses (distance from the center of one plant to the center of the next) is based on the mature width of the selected species of grass and the desired width of movement aisles between. The table of selected cultivars below indicates minimum and maximum on-center plant spacing. Minimum spacing will provide narrow aisles and close contact with plants; maximum spacing (as illustrated in Figures 1 and 2), will result in wider aisles supporting more active chase games. 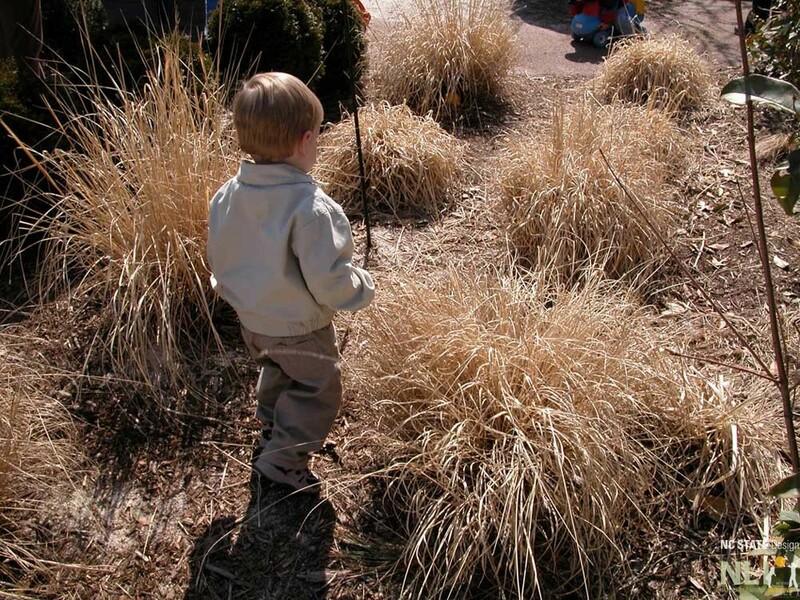 Mature height of grasses should not exceed four feet, so they do not block adult views of children. The mature height of many ornamental grasses includes the height of seed heads, which does not obscure views. Ornamental grasses offer a fascinating annual growth cycle and can provide year-round sensory interest if properly managed. As the weather begins to warm in the spring, new, green leaves emerge and by the end of summer will have reached their mature height. In Fall, seed heads emerge in dramatic fashion. In winter, dormant foliage continues to support play, provides endless natural loose parts, and protects the plant from hard freezes. After the last frost and just before the new leaves emerge, the brown dormant leaves can be cut back to 3”-6” above the ground with pruning shears. Simply tie together the top growth with twine before cutting to keep the leaves bundled together and to simplify clean-up. Cut leaves can be used as loose play material. Natural, plant-based mulch, such as shredded hardwood mulch or woodchips, are best practice groundcovers. Grass mazes can be installed in existing turf grass with the understanding that children will create wear patterns and the worn lawn will eventually have to be covered with mulch. Grass mazes can be planted with a single cultivar of ornamental grass or a combination of cultivars of various heights, colors, and textures. 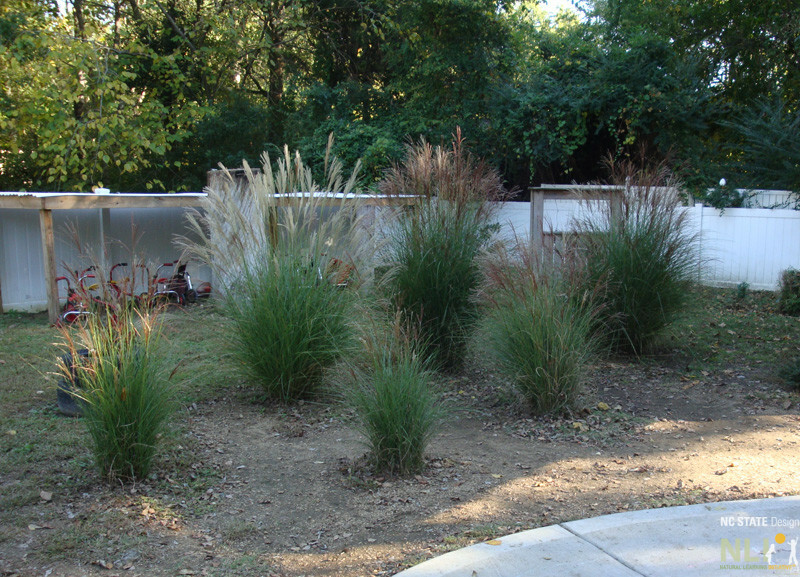 To achieve an upright, dense form, many ornamental grasses require full sun. 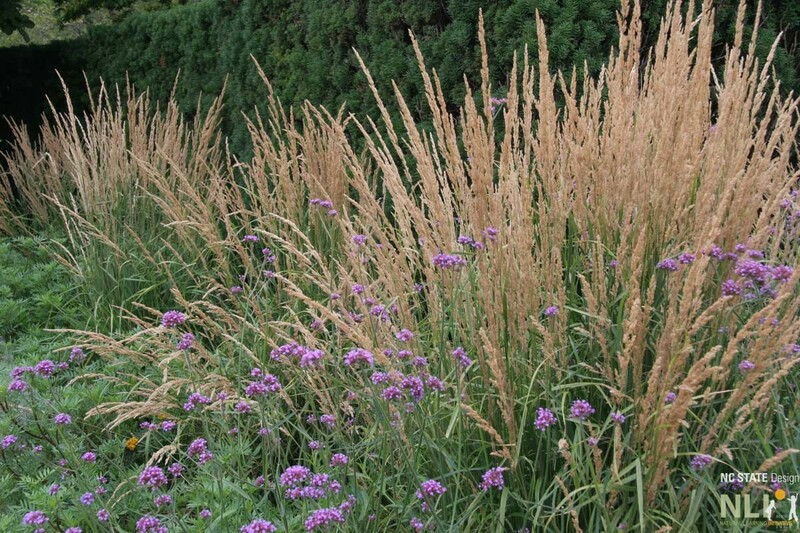 Some ornamental grasses are sensitive to soil moisture and prefer well-drained soils. Improve damp soils with amendments or regrade to improve drainage. Consider site conditions and consult local experts. 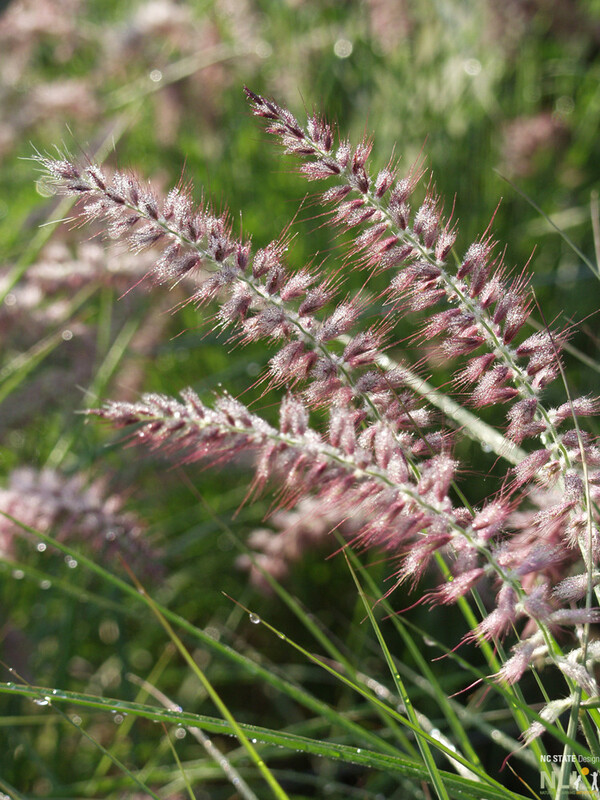 Grass cultivars suitable for North Carolina are listed below. They are hardy, soft to the touch, drought tolerant, and withstand compaction around their roots. 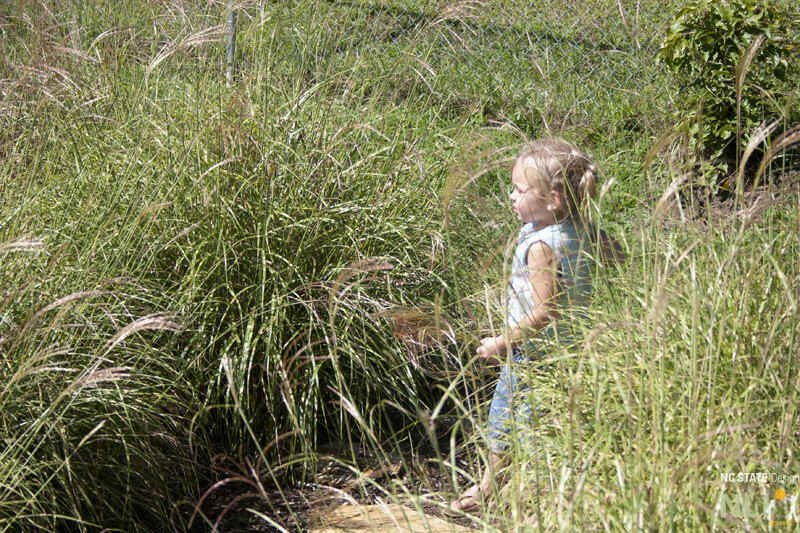 A girl enjoys the sensory experience the grass maze of Miscanthus sinensis ‘Adiago’ affords at Genesis Academy, Burnsville, NC. Exploring a dormant grass maze in cooler months. Calamgrostis x acutiflora ‘Karl Foerster’ (Feather reed grass) contrast with Verbena bonariensis. (Courtesy of Hoffman Nursery). 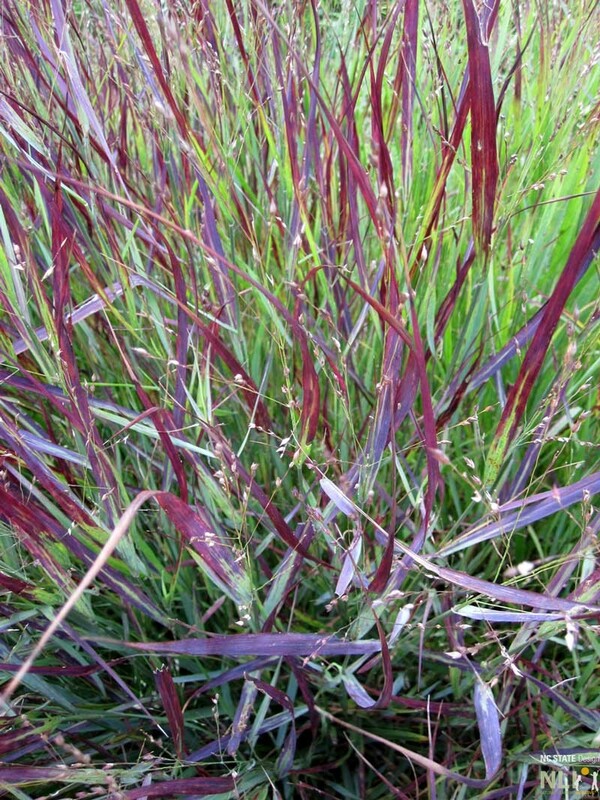 Beautiful burgundy-red foliage of Panicum virgatum ‘Shenandoah’ (Shenandoah switch grass). (Courtesy of Hoffman Nursery).